Congratulations to Mr. Chris Reilly, DSAOC’s Educator of the Year! The Down Syndrome Association of Orange County (DSAOC) is thrilled to announce our 2014-2015 Educator of the Year, Mr. Chris Reilly, a 2nd grade general education teacher at St. John the Baptist Catholic School. Mr. Reilly defines inclusive teaching and person-centered planning, per Carrie Ro, who nominated Mr. Reilly. Carrie explains that it is a team effort when it comes to inclusive education, and her son, Jonathan, has bloomed due to Mr. Reilly’s approach. 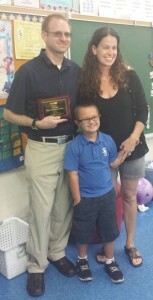 Mr. Reilly was recognized at his school last week by DSAOC and Jonathan’s family. We will also recognize him again at our upcoming Orange County Buddy Walk, on Sunday, November 1 at the Angel Stadium of Anaheim. Congratulations, Carrie Ro and Mr. Reilly! DSAOC received many amazing nominations, and as always, it was a tough decision for the judging committee to pick just 1 winner. We appreciate all of our families who took the time to nominate the individual or team whose efforts are making a positive difference for children with Down syndrome. All nominees received a letter and certificate acknowledging their amazing work, and their leadership team was also notified. Mark your calendars! The 2015-2016 Educator of the Year nomination period will open in March of 2016. Congratulations to all of our nominees, and thank you DSAOC families for letting us know about all the great things happening in our community for our loved ones with Down syndrome.